A customized treatment which suits your needs. The treatment starts with a consult, here we discuss your specific stress points and needs. I than adapt the treatment with differents techniques for an optimal health. Dien Chan Zone is a simple and very effective technique aimed at restoring the recovery of health. It is based on massaging and stimulating different areas and reflex points in the area of the face. This beautiful and therapeutic treatment will bring you in a relaxing and meditative state where the energy flow of the body will be restored. Facial reflexology is a treatment of the face, which is similar to foot reflexology. Originated from Eastern medicine there are different pressure points / reflex zones, just like on the feet and hands, which are connected to certain systems in the body. Facial reflexology has very potent healing effects for back or neck pain, poor digestion, migraines, stress, hormonal imbalances and even mental or emotional conditions such as anxiety and depression. You also receive a 21-day self-care ritual to continue the benefits of facial reflexology. Ayurvedic massage is part of ancient Indian medicine. It is a soft energetic massage which results in a deep relaxation. The focus of this treatment is reinstating a balance of mind and body. During this massage I will choose and oil suitable for your constitution. The oil penetrates the skin and feeds every fiber in the body. You experience a sensation of warmth, comfort and stability. Besides relieving tension in muscles and releasing joints the massage also focuses on restoring the energy system by using certain pressure points, namely marma points. The massage has a powerful effect on our nervous system causing you to reconnect and look at your life as well as take the right steps to take decisions. During this massage I use 100% natural organic (sesame, coconut, almond) oils. A comforting and relaxing massage where the main focus is stress reduction supported by the smells of the wonderful aroma’s. The essential oils used have a healing component which stimulates the bodies natural capacity to heal itself. 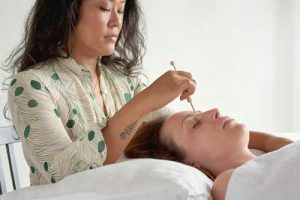 This technique is a combination of Eastern medicine and modern aromatherapy, where oils are applied to the meridian lanes of traditional Chinese medicine. The reflex pressure points in the feet and the ears are stimulated. During the treatment 8 oils are applied to the back, head and feet. Every oil has a different effect on the nervous system and consists of four stages: stress reduction, improving the immune system, reducing inflammatory reactions in the body and homeostasis. The oils are 100% natural pure essential oils of therapeutic quality.